A new feature that we will have on TOM is the “All-2000’s Team” for a respective school. We will go weight-by-weight to feature the best lineup that a team could put together comprised of wrestlers that were in action from the year 2000 to now. Their career could have started in the 1990’s, they just need to have one year of competition in the 2000’s. Each wrestler that is mentioned must have competed for one postseason at their weight class (even if it wasn’t the weight they were most known for). 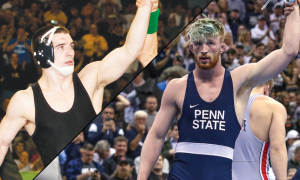 This spot could be taken by Spencer Lee as soon as next year, but for the time being, we’ll stick with McDonough due to their careers being very similar after one season. McDonough came out of the gate and won an NCAA title as a freshman in a weight class that featured past NCAA Champions Angel Escobedo (Indiana) and Troy Nickerson (Cornell). McDonough put together a tremendous first three years of his career before injuries disrupted his senior campaign. Eric Juergens was named the Big Ten Wrestler of the Year in 2001 after completing his career with his second consecutive NCAA title; he also picked up Big Ten Championships in each of his last two seasons. Juergens never finished lower than third at nationals and ended his career winning 65 of his previous 66 matches. Doug Schwab is the only member of this group that appears among the top-ten on Iowa’s all-time wins list (10th with 130 wins). After placing sixth in the Big Ten and winning two matches at the 1998 NCAA Championships, Schwab returned and won both events in 1999. He would win the Big Ten’s in each of the next two years and place in the top three at nationals. One of only two Iowa wrestlers to win the Hodge Trophy (Mark Ironside is the other), Brent Metcalf, captured the trophy as a sophomore when he won what is said to be the toughest weight class ever. In his final three matches of the tournament, he defeated Lance Palmer (Ohio State), Jordan Burroughs (Nebraska), and Bubba Jenkins (Penn State). Metcalf was the leader of an Iowa team that stopped a seven-year team title-less drought in 2008. The Hawkeyes would win one in all three seasons in which Metcalf competed. TJ Williams’ .990 winning percentage has made him the program’s all-time leader in that category. In three seasons wearing a Hawkeye singlet, Williams only dropped one bout, in the 2000 NCAA semis. He is one of only four Iowa wrestlers (Jim Zalesky, Mark Ironside, Lincoln McIlravy) to rack up multiple undefeated seasons. Williams’ weight class his senior season featured a past NCAA Champion Kirk White (Boise State), a champ the next season (Luke Becker), two-time runner-up Bryan Snyder (Nebraska) and perennial contender Shane Roller (Oklahoma State). We’ve all heard the story about how Perry chose his own path and enrolled at Iowa despite his families Oklahoma State tradition. Mark then earned his first NCAA title with a comeback victory over rival Johny Hendricks (Oklahoma State), the only win by Perry in their series of matches. As a senior, Perry missed a large chunk of the dual season due to injury, yet was able to defeat Eric Tannenbaum (Michigan) to take his second NCAA title and avenge a Big Ten loss to the Wolverine. Along with Metcalf, Jay Borschel was an NCAA Champion on Iowa’s most recent title-winning team, one that was victorious by a 44.5 margin. Borschel’s NCAA Finals match pitted him against fellow undefeated, top-seeded Mack Lewnes (Cornell). The bout was one-sided in the Iowa wrestlers favor. It marked the second time that Jay got onto the NCAA podium, as he was third in 2008. Surprisingly enough the Hawkeyes have not had an NCAA champion in this area of weights since Lee Fullhart (190 in 1997) or Royce Alger (1988). Jessman Smith was a wrestler that got progressively better in each season while wrestling for Iowa. As a freshman, he was not seeded at nationals, yet made it to the Round of 12. He duplicated that feat a year later, after getting the eighth seed. His highest placement came as a junior when he was third. Before Rob Rohn’s (Lehigh) pin to win an NCAA title in 2002, he had another against Smith in the semis. Jessman then put together a senior year that was worthy of a top seed at the 2003 NCAA Championships, before finishing fourth. At this weight, we’re going with Nathan Burak who had a consistent, productive career opposed to Ryan Fulsaas who made the NCAA finals in his only NCAA Championship appearance. Burak is the only multi-time All-American at this weight for the Hawkeyes during this time period. In addition to AA’ing three times, Burak also won the Midlands Championships twice. Though he only spent two years competing for the Hawkeyes, what a tremendous two seasons they were. Steve came to Iowa City as one of the most highly touted recruits ever. He immediately established himself as one of the best 285 lbers in the nation, racking up a 37-3 record and making the national finals, all as a true freshman. 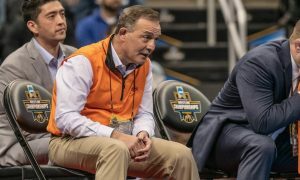 The next season Mocco was an undefeated NCAA Champion and became the first champion at heavyweight for Iowa since Lou Banach in 1983.